4 The Catalyst A WEEI< IN PREVIEW Thesday, November 26 Michael Moore will speak at the Univer ity of Florida at 8:00p.m. A caravan is being planned to make the trip. For more details, contact Eric Piotrow ki at piotrows@ virtu.sar. usf edu. Thursday, November 28 Thanksgiving potluck at 2:00p.m. at 4616 Leeta Lane, Sarasota. Bring food and keep it vegetarian. S u nday, Decembe r 1 Tahia's Caberet, featuring live music and dance from around the world, will take place at 7:00p.m. at the Adult Recreation Center, 80 I N. Tamiami Trai 1, Sarasota. Call 349-3494 for details. The Black Crowe and Gov't Mule will perform at the Mahaffey Theatre in St. Peter burg. Thursday, December 5 The New Col lege Chamber Singers, under the direction of Professor Steve Mile will per form Jo quin De prez's "Missa Pange Lingua," plus Gregorian chants on Thursday, December 5 at 8:00p.m. on the College Hall patio. OBITUARY Robert A Summers, 65, of Bradenton died November 21, 1996 in PersonaCare of Bradenton. A memorial service was held on Sunday at Veterans of Foreign Wras Palma Sola Post o. 10141. Mr. Summers was known at New College as the day manager of the C Store. He was born in Columbus Ohio, and moved to Manatee Cty. in 1971. He was a commander of VFW Palma Sola Post 10141. He served in the US Anny Air Corps during the Korean War. He is survived by his wife, Mary JoAnn, two daughters, four sons, two sis ters, 11 grandchildren, and two great-grandchildren. News "UHURU" FROM PAGE 1 various states nationwide dedicated to "exposing and defeating the US govern ment war against the African community The Uhuru movement has roots in the Black Panther Party of the 1960s, and is currently working to release Fred Hampton, Jr., son of a prominent Black Panther leader and leader of the Chicago branch of NPDUM from jail in Illinois. St. Petersburg branch Secretary Wendy Snyder also explained the role of the African Peoples Solidarity Committee, of which she is a part, in the movement. "As a white member of the Uhuru move ment ... what is important is that there is a North American mentality that supports this government oppression of the African people and this movements allows people to make that break." The Committee, con sisting predominately of white members, acts in solidarity and support to the Uhuru movement. Snyder explained that she thinks that support is important becau e "rich or poor, we have had a history of at tacking the African community and benefiting from the African community." Students and other members of the au dience posed questions to Zina. Student Christie Guy inquired about the move ment's call for a release of all African-Americans jailed in the US. Zina explained that the Uhurus saw them as political prisoners, explaining that "every one that is put in prison is a prisoner of war." When asked about the movement's response to the violence during the St. Petersburg riots, Zina responded that ''we do see it as a courageous rebellion," and while maintaining that the movement had not advocated the violence, it sympa thized with the response. Zina further commented on the move ment's response to the killing, saying that "we had a people's tribunal where a lot of the witnesses [of the incident] came, we didn't allow media" and that the tribunal's decision that police officers James Knight and Sandra Minor were g u i l ty of murder, was based on evidence that conflicted with the grand jury's previous decisio n Zina also complained of police perse cution of the movement, citi n g the arrests of movement members just before the November 26, 1996 second night of rioting and an attempt to "burn our house down and murder us." She credited members of the local com munity involved in the rioting with protecting the movement. She also blamed the media for "helping to fabri cate and helping to target our organization," saying that they had quoted a chant at a movement protest as "Kill the killer cops," while Zina maintained that the chant had actually been "Jail the killer cops." She also cited the example of radio station WFLA-970, which she charged had been raising money to assist Knight and had held a contest to find the best car icature ofTyRon Lewis. Professor of Political Science Paul Buchanan inquired about the Uhuru movement's emphasis on race rather than class-based revolutionary socialism. Zina responded U1at while Omali Yeshitela, founder of the chapter, was familiar with Marxist-Leninist thought, he had founded it based on "his experience as an African American working class person." NCSA President Jessica Falcone asked Zina what New College students could do to assist the movement. Zina recom mended that they officially join the Uhmus, attend conferences, and assist with fundraising activities. Afterwards, Odom said of the discus sion, "I was ve r y satsified with the outcome and I was very impre sed with the que tions that were posed by the stu dents." Facilitator Macio agreed, but he added, "I feel very strongly that they [the Uhuru movement] are not they on l y peo ple who arc trying to do something both in St. Pete and the rest of the country." Zina suggested that "I believe maybe a study group could be formed here to get an understanding about our philosophy." She added, "I think the most impor tant thing was giving people insight int o the movement and explaining to them what really happened during these two weeks. The rebellion was a just rebellion and a response to the violence in our community that is perpetuated every day, and I think that we were heard all around the wor l d and that is not a bad thing." ''I'm g l ad they came here," said stu dent Nick Napolitano, "I just hope New College s t udents do more than just lis ten." 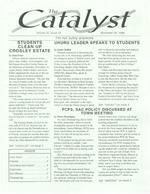 The Catalyst November26, 1996 7 THE TRUTH OF THANKSGIVING by Charles Choi Celebrations are curious things. Their origins are often a mix of fact and fiction. Take Thanksgiving, for example. It is an uniquely American cxpcnence, when families get together for a long weekend of feasting before winter comes. Popular culture has seeded us with images of Pilgrims and Indians; pioneers fled from religious persecution demonstrated the pirit of charity by haring their fruits with the native peoples of the fronlier. The truth of the matter is not quite as noble as the lie. are. The Puritan Pilgrims were victims of discrimination. but they them elves as the "Chosen Elect" mentioned in Revelations and trove to purify themsclvc!. and everyone who did not accept their interpretation of scripture. This fundamentahsm IS best illustrated in the first Thanksgiving ermon delivered at Plymouth in 1623 by Mather the Elder, who gave thanks to the Lord for the plague of smallpox which wiped out most of the Wampanoag tribe, the "young men and children, the very seed of increase, thus clearing the forests to make way for a better growth." The Pilgrims believed that the end was nigh and the Four Horsemen of the Apocalypse rode in with them. When the Pilgrim arrived in America in 1620, their fir t winter was hard and the sick outnumbered the healthy. As many as half the P1lgrims may have died from cold and hunger. A generation after !he Jirst Thanksg1vi ng there was the genoctdal conflict hetween the Indians and the Pllgnms known as King Phillip's War. So let us take a look at the very word Thanksgiving. What are we giving thanks for? Let us cons1der the turkey for a second. owadays, it's an overfed bird that's been injected with honnones for sale in a commercial franchise. But consider the meaning it must have had back then for those starving Pilgrims who had to wrap them-selves in layers of clothing made filthy by too much u em order to live. A plump bounty to fend ofT death, if only tor a while lt should be noted, then, that the true reason that the Warnpanoag tribe was invited to the Thanksgiving celebration was for the purpose of 11cgotiating a treaty that would ccure the lands of the Plymouth Plantation for the Pilgrims, in hopes for a common defense against the Iroquois. It was the Indians who brought the majority of the food for the feast, cnotJgh to last for week afterwards. Thanksgiving, then, gives thanks to the f<1 vegetarian potluck will be held that is open to everyone. This year, Chris Martin, Coordinator of Public Affairs. was instrumental in raising $1600 to buy nonperishable foods for a local community center and church. This money was rai ed from student food card money, and goc mto an nccount which Marriott can use to buy canned goods so that the needy can have a happy Thanksg1ving. The largest donalion from a student was $150, and other donations were in the $100 range as well. We arc what we eat, after all. And we Lh ink, and what we breathe, and what we Jearn. The theme of Thanksgiving ha a nobility above and beyond just the story of the founding o the Plymouth Foundation. Let us hope that through this commercial sacrament of turkey and cranberry sauce that we perhaps may remember Thanksgiving as a holiday commemorating strangers reaching out to one another in the spirit of community. GUEST OPINION: NOVOCOLLEGIANS OSE OUT ontributed by Jessica Chapman There 1s a conference held each year that would be informa tive to students interested in Florida, writing, or New College itself. Sound good? Well this year you missed it, along with almost every other tudent and faculty member. The sixth annual John D. MacDonald Conference was held ovember 15. 16 and 17 here in Sarasota John D. Macdonald was an internationally known author who wrote over 50 novels in genres ranging from science fiction to my tery. He also submiued over 500 tories to different maga zines. 30 of hts stones were adapted for television, and the script for the original Cape Fear was based on his novel The Executioners. He Js most famous for his Travis McGee series, wh1ch is set in Florida and address issue of the state's environ mental decline. Events look place at MacDonald's former residence, lhe Hyatt Hotel, a11d the. 'e'" College campus. Didn't see any posters or read about it in The Catalyst? Well. for some reason thi nationally recogm:z.ed conference wasn't widely advertised. There were flyers posted outside the library and in College Hall. ut nm m the Humanitie office. lac Miller didn't even know that it was taking place here. Why wa it here, you ask? Well, in addition to being a famous writer and a F-lorida resident, MacDonald was also a major figure at New College. He donated money to help start the chool, was on the original Board of'frustee and remained on the board for nine years. In 1990, he contributed item to I he Foundation Action Auction, which made $66.000 for New College. Also, an endowed cholarship in hi name wa estalr lished here by his wife in 1987. The openmg events took place at College Hall. where Deans Schenck and Micnalson welcomed participants to cw College. The first haJf oft e the program was in our own Sudakoff Center, where selected profe sor and other peaker gave pre sentations on MacDonald's works. 1he mal day' activities were held at the hotel and included a panel discussion entitled "'The Staying Power of John D MacDonald' Writing." A much as 1 ew College claims to want to be a part of the Sarasota community, 1t seem a true tragedy that we mi sed an opportunity to attend an event that honor omeone who wa 1m portanL to both, in addition to being a major figure in contemporary literature.